We recently identified recessive mutations in the solute carrier organic anion transporter family member 2A1 gene (SLCO2A1) as causative variants of chronic nonspecific multiple ulcers of the small intestine (chronic enteropathy associated with SLCO2A1, CEAS). The aim of this study was to investigate the gastroduodenal expression of the SLCO2A1 protein in patients with CEAS and Crohn’s disease (CD). Immunohistochemical staining for SLCO2A1 was performed with a polyclonal antibody, HPA013742, on gastroduodenal tissues obtained by endoscopic biopsy from four patients with CEAS and 29 patients with CD. The expression of SLCO2A1 was observed in one of four patients (25%) with CEAS and in all 29 patients (100%) with CD (p<0.001). The three patients with CEAS without SLCO2A1 expression had a homozygous splice-site mutation in SLCO2A1, c.1461+1G>C (exon 7) or c.940+1G>A (exon 10). The remaining one CEAS patient with positive expression of SLCO2A1 had compound heterozygous c.664G>A and c.1807C>T mutations. 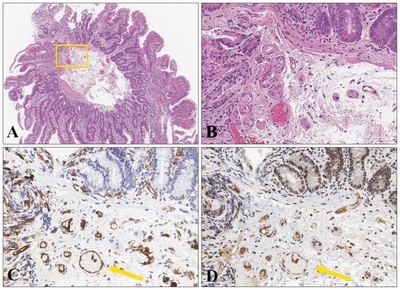 Immunohistochemical staining for SLCO2A1 in gastroduodenal tissues obtained by endoscopic biopsy is considered useful for the distinction of CEAS from CD. Recently, we evaluated SLCO2A1 protein expression in the intestinal tissues of patients with CEAS.11 In the present study, we evaluated the immunohistochemical expression of the SL-CO2A1 protein in gastroduodenal tissues obtained by endoscopic biopsy from patients with CEAS and CD to examine whether biopsy specimens can be used for distinguishing these diseases from each other. We reviewed the clinical files of patients diagnosed with inflammatory bowel diseases at our institutions between 2001 and 2014. There were 29 patients with CD and four patients with CEAS. Characteristics in three of the four patients with CEAS had been described in the previous study,11 while all the 29 patients with CD were completely different from those in the previous study. All 33 patients had undergone esophagogastroduo-denoscopy with multiple endoscopic biopsies from the normal-appearing gastroduodenal mucosa. In 23 patients with CD and three patients with CEAS, biopsy specimens were obtained from both the gastric and duodenal mucosa. In other four patients with CD and the remaining one patient with CEAS, the specimens were taken only from the duodenum. In the remaining two patients with CD, that was taken only from the stomach. The mean number of the biopsy specimens was 3.6 in CD cases and 3.5 in CEAS cases (Table 1). The diagnosis of CD was based on the established Japanese criteria.12 All study participants provided written informed consent for this analysis. The study protocol was approved by the ethics committee at Iwate Medical University Hospital (H28-59; August 4, 2016) and Kyushu University (439-06; January 26, 2015). The study was conducted in accordance with the Helsinki Declaration. In all four cases of CEAS, mutations in the SLCO2A1 gene were analyzed, as described previously.6 Briefly, DNA was extracted from peripheral blood using standard methods, and Sanger sequencing of exons 4, 5, 7, 10 and 13 of the SLCO2A1 gene was performed to identify the mutation sites.6 In the 29 cases of CD, however, mutations in the SLCO2A1 gene were not analyzed. In all 33 cases, immunohistochemical staining was performed on 4-μm thick sections cut from each of the formalin-fixed and paraffin-embedded tissue blocks with a polyclonal antibody for SLCO2A1 (HPA013742; Sigma-Aldrich, St. Louis, MO, USA) and a CD31 monoclonal antibody (Santa Cruz Biotechnology, Santa Cruz, CA, USA) using the Dako Envision system (Dako, Glostrup, Denmark) according to the manufacturer’s instructions. The immune expression of SLCO2A1 in vascular endothelial cells, as confirmed by CD31 immunostaining, in the respective lesions was determined to be either positive or negative by two independent observers (S.Yanai and N.U.). Differences between groups were evaluated with a Fisher exact test, chi-square test or a Mann-Whitney U-test as appropriate. All p-values <0.05 were regarded as statistically significant. The clinicopathologic features of the study patients are summarized in Table 1. While the median age at diagnosis did not differ between patients with CD (23 years) and patients with CEAS (28 years), the median age at biopsy was significantly younger in CD patients (31 years) than in CEAS patients (63 years, p<0.001). Patients with CD were predominantly male, while CEAS patients were predominantly female. However, the difference was insignificant. Colorectal involvement was confirmed in 27 patients with CD (93%), but in none of the patients with CEAS (p<0.001). Laboratory data, including hemoglobin, albumin and C-reactive protein (CRP) levels did not differ significantly between CD and CEAS, though the mean CRP level was higher in CD (2.3 mg/dL) than in CEAS (0.8 mg/dL). Treatment with biologics (infliximab or adalimumab) was carried out in 25 of 29 patients (86%) with CD, while none of the four patients with CEAS (p=0.001) were undergoing treatment with biologics. SLCO2A1 expression in the gastroduodenal tissues was confirmed in all 29 patients with CD (100%) (Fig. 1). In contrast, SLCO2A1 expression was found only in one of the four patients with CEAS (25%, p<0.001) (Table 1, Fig. 2). Both the gastric and duodenal tissues were examined in 23 of 29 patients with CD and in three of four patients with CEAS. Between gastric and duodenal tissues, SLCO2A1 expression pattern did not differ in all the 23 patients with CD and all the three patients with CEAS. In all the 23 patients with CD, SLCO2A1 was positive both in the gastric and duodenal tissues. In all the three patients with CEAS without SLCO2A1 expression, it was negative both in the gastric and duodenal tissues. As shown in Table 2, three of four patients with CEAS without SLCO2A1 expression (cases 1, 2, 4) had a homozygous splice-site mutation in the SLCO2A1 gene, c.1461+1G>C (exon 7) or c.940+1G>A (exon 10). The remaining CEAS patient (case 3) with positive expression of SLCO2A1 had compound heterozygous mutations of c.664G>A and c.1807C>T. Development and widespread use of enteroscopy, such as balloon endoscopy13 and capsule endoscopy,14 have enabled gastroenterologists to observe mucosal lesions of the whole small bowel. Therefore, the opportunities for diagnosing small bowel diseases have increased. However, the practical and accurate diagnosis of various ulcerative disorders of the small bowel, such as CD, intestinal Behçet’s disease, CEAS, cryptogenic multifocal ulcerous stenosing enteritis15,16 and nonsteroidal anti-inflammatory drug induced enteropathy is a matter of debate, because those diseases are often difficult to distinguish from each other by endoscopic findings alone. CEAS, previously referred to as CNSU, is a rare autosomal recessive inherited disease characterized by chronic blood and protein loss through persistent, intractable and histologically nonspecific small bowel ulcers. The SLCO2A1 gene, which encodes a prostaglandin (PG) transporter, has been identified as a causative gene not only for CEAS, but also for a subtype of primary hypertrophic osteoarthropathy (PHO)/pachydermoperiostosis (PDP).17–21 Dysfunction of the SLCO2A1 protein would cause the failure of prostaglandin E2 (PGE2) re-uptake, resulting in high PGE2 in serum and urine. Compton et al.9 and Shim and Suh10 previously reported family pedigrees of patients with CD combined with PHO. On the basis of the above-mentioned identification of the SLCO2A1 gene, it can be speculated that the families had actually been suffering from CEAS rather than CD. In our previous study,6 two of 603 patients with a clinical diagnosis of CD were found to have compound heterozygous mutations in SLCO2A1, and accordingly, we revised the diagnosis for those two patients as CEAS. It thus seems possible that cases of CEAS are clinically misinterpreted as CD, probably because of apparently indistinguishable clinical manifestations, such as small intestinal ulcers, anemia and hypoproteinemia. Genetic analysis is therefore mandatory for distinguishing CEAS from CD. It has been confirmed that the SLCO2A1 protein is expressed on the cellular membrane of vascular endothelial cells within the small intestinal mucosa and submucosa in healthy subjects.6 In our previous study, loss of SLCO2A1 protein expression in the resected intestinal tissues was confirmed in two of three patients with CEAS, while the expression of the protein was positive in all 22 patients with CD or intestinal Behçet’s disease.11 In the present study, we further confirmed similar findings in the gastroduodenal mucosal tissues obtained by endoscopic biopsy. As a result, loss of SLCO2A1 protein expression was evident in three of four patients with CEAS (75%), but in none of the 29 patients with CD. It thus seems possible that in patients with loss of SLCO2A1 protein expression in biopsy specimens, genetic analysis for the SLCO2A1 gene may not be necessary for the clinical diagnosis of CEAS. It should be noted that one of the cases of CEAS (case 3) was positive for SLCO2A1 protein expression, even though the case had compound heterozygous mutations of the SLCO2A1 gene. While the full and complete SLCO2A1 protein is composed of 643 amino acids, the antibody we used for the present study (HPA013742) detects only the 83 amino acids in the fifth extra-cellular domain encoded by exons 9–11 (431–513) (The Human Protein Atlas, http://www.proteinatlas.org/ENSG00000174640-SLCO2A1/antibody). The antibody presumably detected a non-truncated SLCO2A1 protein, and, therefore, immunohistochemistry showed a false positive result, even though the protein was dysfunctional. Since truncated mutant alleles have been reported to account for approximately two-thirds of the mutated alleles found in patients with CEAS, it can be presumed that more than 60% of cases of CEAS can be correctly diagnosed with the use of immunohistochemical staining for SLCO2A1. This study has several limitations. In the first place, the rarity of CEAS did not allow us to examine a large number of patients with the disease. Actually, three of four patients with CEAS were included in our previous study dealing with surgically removed intestine.11 However, we could show in the present study that biopsy specimens from apparently normal gastroduodenal mucosa, which can be easily obtained by endoscopy, may be valuable for differentiating CEAS from CD. In the second place, the retrospective nature of our investigation did not allow for genetic analysis of SLCO2A1 in our CD patients. In fact, two out of our 603 patients with a diagnosis of CD had a genetic diagnosis of CEAS in our prior investigation.6 Because genetic analysis is a gold standard for the distinction of CEAS from CD, a comparison of genetic diagnosis and immunohistochemical features are inevitable to validate the results of our present investigation. However, we believe that immunohistochemical staining for SLCO2A1 expression together with confirmation of clinical characteristics, that is, chronic blood loss and protein loss through persistent, intractable small bowel ulcers, are essential to screen subjects who are candidates for genetic analysis of SLCO2A1. In conclusion, immunohistochemical staining for SLCO2A1 in gastroduodenal tissues obtained by endoscopic biopsy may be useful for the distinction of CEAS from CD. With the use of the immunostaining, approximately two-thirds of patients with CEAS could be correctly diagnosed. This work was supported in part by a grant from the Japan Agency for Medical Research and Development (AMED) (15ek0109053h0002). The authors would like to thank Professor Tadakazu Hisamatsu, Kyorin University, Mitaka, Japan for his valuable comments on the immunohistochemical study of the SLCO2A1 protein. T.M. has received grant support from AbbVie, Japan. The other authors declare that they have no conflicting interests. Fig. 1. Photomicrographs of the duodenal tissue obtained by endoscopic biopsy from a patient with Crohn’s disease. (A) Low-power view showing the duodenal mucosa and submucosa with a mild chronic inflammatory infiltrate (H&E, ×40). (B) Mid-power view showing several capillary vessels in the deep mucosa and superficial submucosa (H&E, ×200). (C) CD31 immunostaining highlights the vascular endothelial cells of the capillary vessels (arrow) in the mucosa and submucosa (×200). (D) SLCO2A1 immunostaining. Expression of the SLCO2A1 protein can be observed in the vascular endothelial cells (arrow) in the duodenal mucosa and submucosa (×200). Fig. 2. Photomicrographs of the duodenal tissue obtained by endoscopic biopsy from a patient with chronic enteropathy associated with SLCO2A1 (CEAS). (A) Low-power view showing the duodenal mucosa with a mild chronic inflammatory infiltrate (H&E, ×40). (B) Mid-power view showing several capillary vessels in the deep portion of the mucosa, (H&E, ×200). (C) CD31 immunostaining highlights the vascular endothelial cells of the capillary vessels in the mucosa (arrows) (×200). (D) SLCO2A1 immunostaining. No SLCO2A1 protein expression can be observed in the vascular endothelial cells (arrows) in the duodenal mucosa (×200). Data are presented as median (range), mean±SD, or number (%). CD, Crohn’s disease; CEAS, chronic enteropathy associated with SLCO2A1; CRP, C-reactive protein; 5-ASAs, aminosalicylates; AZA, azathioprine; 6-MP, 6-mercaptopurine; IFX, infliximab; ADA, adalimumab. CEAS, chronic enteropathy associated with SLCO2A1. Matsumoto, T, Iida, M, Matsui, T, and Yao, T (2007). Chronic nonspecific multiple ulcers of the small intestine: a proposal of the entity from Japanese gastroenterologists to Western enteroscopists. Gastrointest Endosc. 66, S99-S107. Matsumoto, T, Iida, M, and Matsui, T (2004). Non-specific multiple ulcers of the small intestine unrelated to non-steroidal anti-inflammatory drugs. J Clin Pathol. 57, 1145-1150. Esaki, M, Umeno, J, Kitazono, T, and Matsumoto, T (2015). Clinicopathologic features of chronic nonspecific multiple ulcers of the small intestine. Clin J Gastroenterol. 8, 57-62. Matsumoto, T, Nakamura, S, and Esaki, M (2006). Endoscopic features of chronic nonspecific multiple ulcers of the small intestine: comparison with nonsteroidal anti-inflammatory drug-induced enteropathy. Dig Dis Sci. 51, 1357-1363. Matsumoto, T, Kubokura, N, Matsui, T, Iida, M, and Yao, T (2011). Chronic non-specific multiple ulcer of the small intestine segregates in offspring from consanguinity. J Crohns Colitis. 5, 559-565. Umeno, J, Hisamatsu, T, and Esaki, M (2015). A hereditary enteropathy caused by mutations in the SLCO2A1 gene, encoding a prostaglandin transporter. PLoS Genet. 11, e1005581. Hosoe, N, Ohmiya, N, and Hirai, F (2017). Chronic enteropathy associated with SLCO2A1 gene [CEAS]-characterisation of an enteric disorder to be considered in the differential diagnosis of Crohn’s disease. J Crohns Colitis. 11, 1277-1281. Uchida, K, Nakajima, A, and Ushijima, K (2017). Pediatric-onset chronic nonspecific multiple ulcers of small intestine: a nationwide survey and genetic study in Japan. J Pediatr Gastroenterol Nutr. 64, 565-568. Compton, RF, Sandborn, WJ, and Yang, H (1997). A new syndrome of Crohn’s disease and pachydermoperiostosis in a family. Gastroenterology. 112, 241-249. Shim, YW, and Suh, JS (1997). Primary hypertrophic osteoarthropathy accompanied by Crohn’s disease: a case report. Yonsei Med J. 38, 319-322. Yamaguchi, S, Yanai, S, and Nakamura, S (2018). 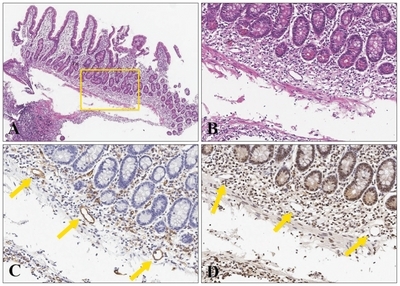 Immunohistochemical differentiation between chronic enteropathy associated with SLCO2A1 gene and other inflammatory bowel diseases. Intest Res. 16, 393-399. Hisabe, T, Hirai, F, Matsui, T, and Watanabe, M (2014). Evaluation of diagnostic criteria for Crohn’s disease in Japan. J Gastroenterol. 49, 93-99. Yamamoto, H, Sekine, Y, and Sato, Y (2001). Total enteroscopy with a nonsurgical steerable double-balloon method. Gastrointest Endosc. 53, 216-220. Iddan, G, Meron, G, Glukhovsky, A, and Swain, P (2000). Wireless capsule endoscopy. Nature. 405, 417. Perlemuter, G, Guillevin, L, Legman, P, Weiss, L, Couturier, D, and Chaussade, S (2001). Cryptogenetic multifocal ulcerous stenosing enteritis: an atypical type of vasculitis or a disease mimicking vasculitis. Gut. 48, 333-338. Chang, DK, Kim, JJ, and Choi, H (2007). Double balloon endoscopy in small intestinal Crohn’s disease and other inflammatory diseases such as cryptogenic multifocal ulcerous stenosing enteritis (CMUSE). Gastrointest Endosc. 66, S96-S98. Zhang, Z, Xia, W, and He, J (2012). Exome sequencing identifies SL-CO2A1 mutations as a cause of primary hypertrophic osteoarthropathy. Am J Hum Genet. 90, 125-132. Sasaki, T, Niizeki, H, and Shimizu, A (2012). Identification of mutations in the prostaglandin transporter gene SLCO2A1 and its phenotype-genotype correlation in Japanese patients with pachydermoperiostosis. J Dermatol Sci. 68, 36-44. Guda, K, Fink, SP, and Milne, GL (2014). Inactivating mutation in the prostaglandin transporter gene, SLCO2A1, associated with familial digital clubbing, colon neoplasia, and NSAID resistance. Cancer Prev Res (Phila). 7, 805-812. Diggle, CP, Parry, DA, and Logan, CV (2012). Prostaglandin transporter mutations cause pachydermoperiostosis with myelofibrosis. Hum Mutat. 33, 1175-1181. Busch, J, Frank, V, and Bachmann, N (2012). Mutations in the prostaglandin transporter SLCO2A1 cause primary hypertrophic osteoarthropathy with digital clubbing. J Invest Dermatol. 132, 2473-2476.